Do you get tired of cooking the same thing the same way over and over? I know I do, that's why I enjoying marrying unlikely items to create bold new flavors. I especially love infusing the flavors of the fruits I grew up with, into my meats and seafood. The recipe below is going to be one of my signature items for entertaining this upcoming football season. It could be yours too! In a large container, clean chicken with juice of 1 lemon and cool running water. Cover with foil and place in preheated oven for 45 minutes. Oh my Goodness!!! I'm trying to do the veggie/fish thing...but Lord knows I would love to make this. 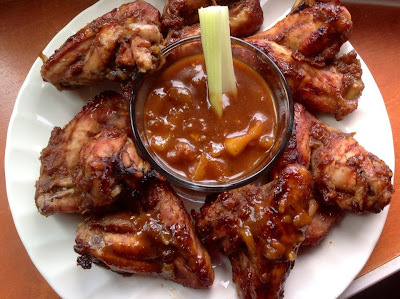 I love wings:) I will try to make this sauce with fish, maybe? Would that work? It does work with fish, but pan sear the fish and then pour the tamarind sauce over it and let it cook for 2 minutes before serving. Use a meaty white fish. I also think salmon absorbs flavors well. Where can one fine tamarind sauce and in what section of the store? I made it from scratch. I placed the link to the recipe in the "preparation". You can find the tamarind pods or pulp in international food stores. I'm doing this recipe on Saturday. I will let you know how it turns out.